Aikatsu Friends! – 033 | Mezashite! Now, you might be wondering why in the world Mirai would give Double Hibiscus a trial that required some other unit to come and save them. Aren’t they supposed to be competing? Maybe you’d think that she knew Aine would help Mika and Shiina no matter what, but that’s not the case. The two of them totally screwed up their trial, and only passed due to Pure Palette’s kindness. Cinderella had a male and female part, for her and the prince, as did The Bluebird of Happiness, which was based on a brother and sister. So why, for no reason, did Double Hibiscus decide to have two Sleeping Beauty’s? The correct answer to their puzzle was for one of them to become her, and the other to be the prince who wakes her up. This not only follows the pattern, but is confirmed because Shiina knows what had to be done beforehand, so she was awake when she saw the sign (proving they didn’t both fall asleep immediately). So yeah, that’s what actually happened. 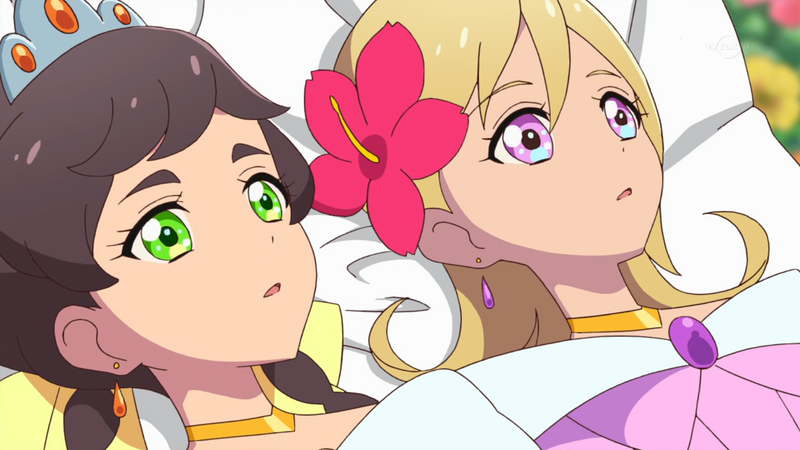 Oh, and if you check the sub file from a month and a half ago I knew that both Honey Cat and Pure Palette would win the Best Friends Cup, because it was never specified in the rules that only one unit could pass. Ah! I knew there was something strange about Double Hibiscus’ part. Thanks for clarifying. 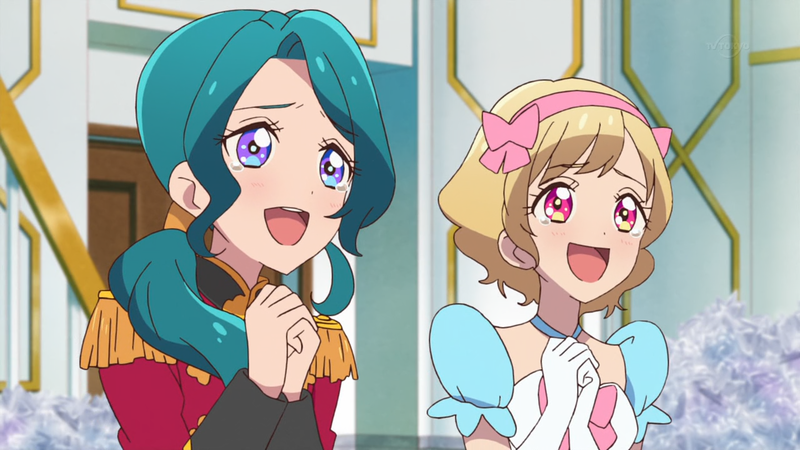 Also, this Thanksgiving, I am thankful for you and your awesome work, as well as the awesome team that keeps Aikatsu going! Thanks for everything! Karen is secretly a sociopath who hides some sadistic tendencies underneath her cute and lovely facade, so it’s to be expected. This is all very heartwarming, until Honey Cat is hospitalized for eating too much custard and has to retire from the Cup. It was quite predictable that this was gonna happen, but I’m satisfied with the execution. Thank you so much for your work, as always. Yeah, I said the same to Akatsukin; while I think it’s silly and predictable that both get to pass, the scriptwriter for this episode did a decently convincing job making a case for it.